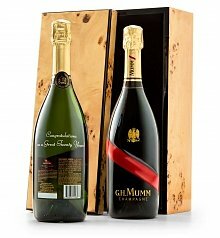 Our distinguished and impressive champagne gift baskets are always in good taste. 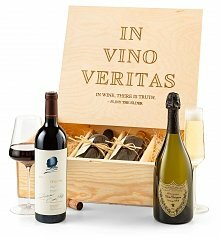 My Aunt has curated the University Library for almost thirty years, and when she finally decided to retire, I surprised her with an elegant champagne gift basket. 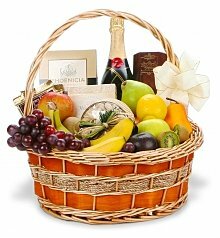 Just as she was getting ready for her retirement dinner, the basket was delivered! She and her friends loved the striking presentation, and unpacking it piece by piece was so enjoyable. The spread was beautiful - creamy cheese and crisp, savory crackers, gourmet chocolate... not to mention the bottle of Moet & Chandon! Each bite and sip was such a delight, my Aunt and her friends forgot all about going to dinner. 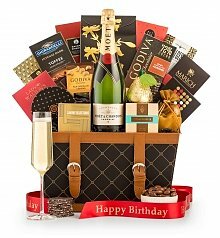 I know I'll be using GiftTree's champagne gift basket delivery again very soon. 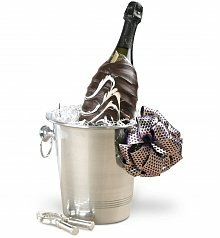 Celebrate with a Bottle of Champagne... and Chocolate! 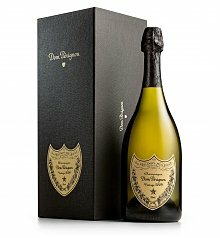 There's something special about the perfect flute of champagne. 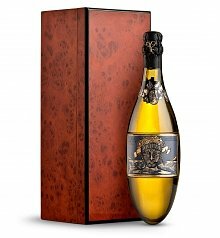 Something magical about those lively little golden bubbles, drifting up to form a lacy blanket over the surface of a crisp, cool gleaming champagne flute. 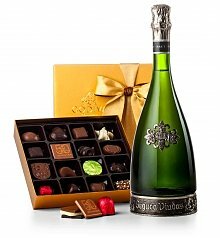 When you're celebrating a special occasion, popping the cork on a bottle of chilled champagne is a party in and of itself, but a glass of champagne can only be made better by pairing it with delicacies like gourmet chocolates, truffles, cheese, or caviar. 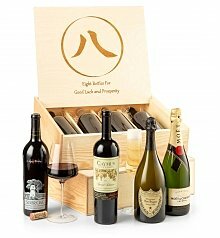 That’s the ambition of GiftTree's selection of champagne gift baskets - to offer expertly curated champagne gift baskets, like the Luxury Champagne Basket - a bottle of world-renowned Veuve Clicquot is accompanied by camembert cheese, rosemary and garlic crackers, truffles and chocolates from Lindt, Godiva and Ghirardelli - it's an exquisite, delicious gift. 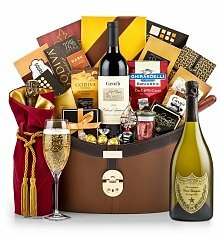 No matter which GiftTree champagne gift basket you select, you can be sure that you're sending a happy celebration, full of prestige and good taste.